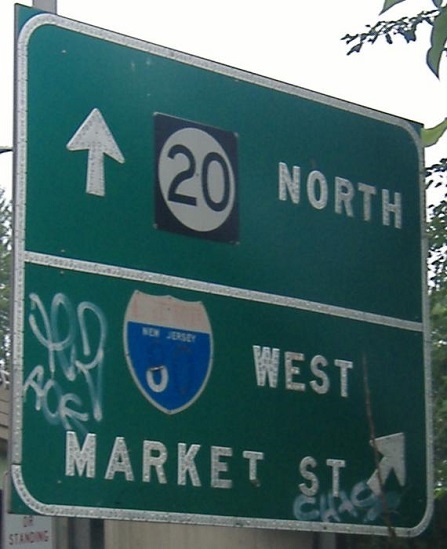 Market Street WB at the NJ 20/I-80 interchange, just across the Passaic River in Paterson. Market St. is broken up by the tangle of loops that define that interchange, but exists on both sides and is not impossible to follow through (though signage isn't the best compared to the routes). 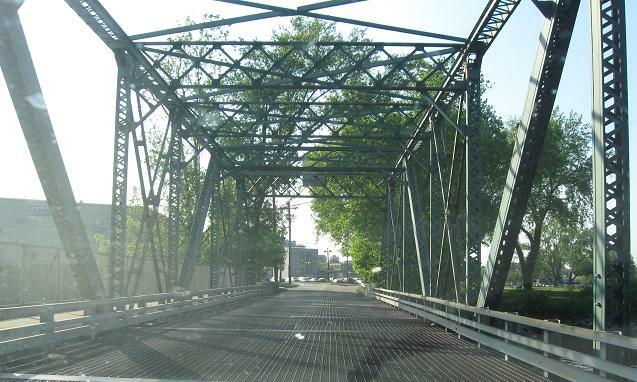 Speaking of that bridge, it's over 80 years old and still allows truck traffic. I bet your 80-year-old grandmother can't support a hundred trucks a day. Wait a minute. There's no route number on this page! Well, with all the freeways nearby, it seems poor old US 46 was forgotten. 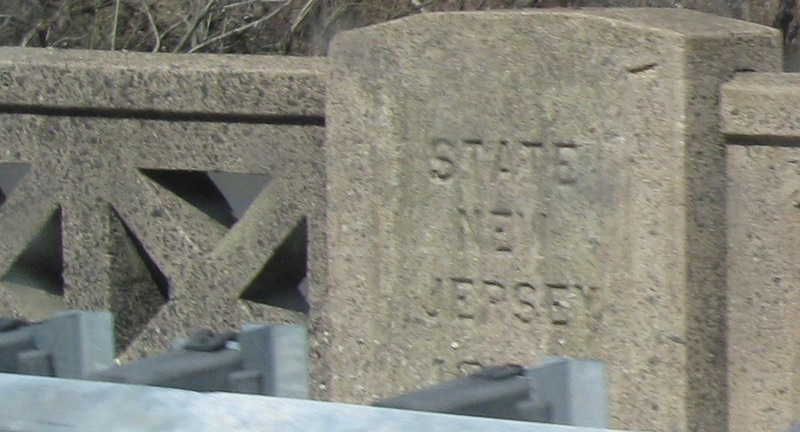 Back when it was NJ 6... no, back further, when it was NJSHR 10 in the original state numbering, US 46 did not have a nice, wide arterial alignment. 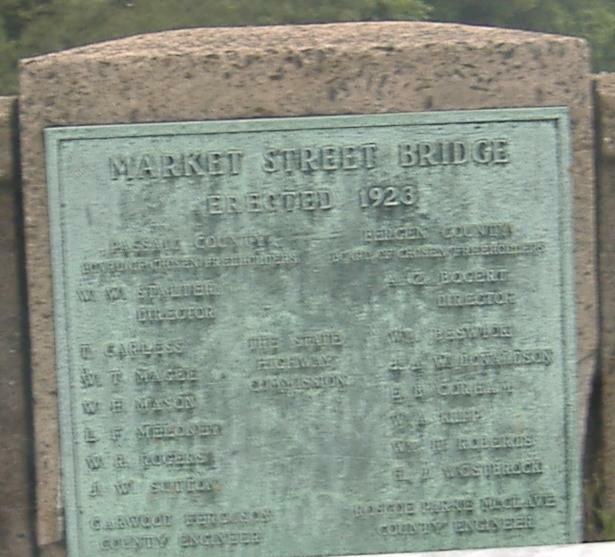 Market Street was one of a few decently long and wide streets carring Route 10 over to the Edgewater ferry into New York, which was the predecessor to the George Washington Bridge. 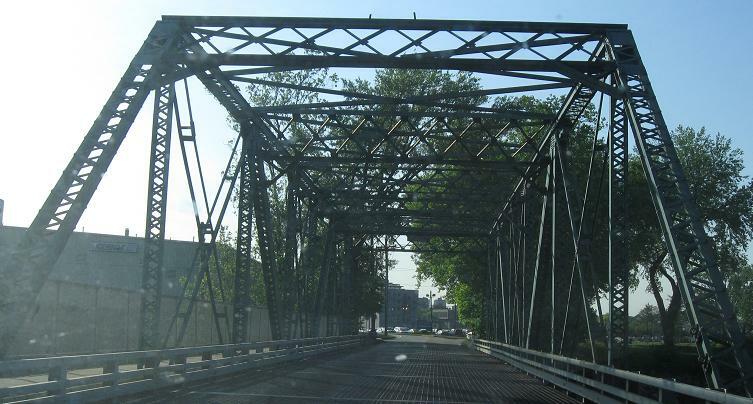 NJ 5 still runs the route from US 1-9 eastward, and if you click on that NJ 5 link you'll see - surprise - another NJSHR 10 bridge! No, this isn't I-80 East. This isn't even to I-80 East really - it's more to I-80 West. May as well have left off the direction. Also, this really isn't CR 12. Or maybe it is. 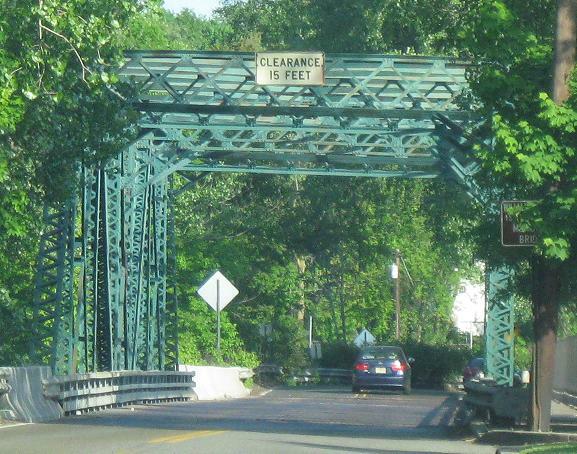 New Jersey calls Market St. and Essex St. CR 56, but at least by signage and in its route log, Bergen County disagrees. Or is it both at the same time, with 12 an overlay route that just happens to follow all of CR 56? 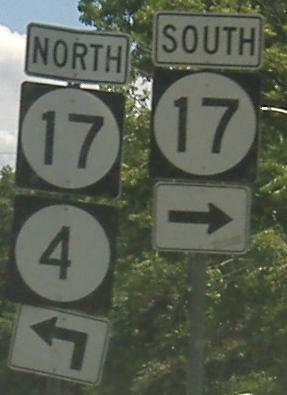 The question arises as to who decides what numbers the county routes are - the county, or the state? Way east to the end of the very short Riverview Ave. at Essex St. Riverview was probably longer once, and probably had a river worth looking at to boot, but now is a one-block connector from I-80 to Essex St. The I-80 EB-NJ 17 NB and SB-WB movements occur along this path, due to space constraints where I-80 was laid over NJ 17 for half a mile to the east, so it frequently backs up. The Garden State Parkway is the third leg of the triangle, but many are averse to paying tolls, and when Bergen Plaza goes one way, probably there will be a very unbalanced traffic load on Riverview and Essex. Anyway, the first sign has too thick a border. The new sign salad that has cropped up around that original old sign now that improvements at I-80 and NJ 17 are all complete. 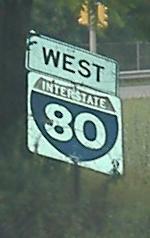 That does mean the state-name I-80 shield is brand-new, an encouraging development. I could do without the space-saver NJ 17 assembly, though. WB Essex St. at Riverview Ave.
EB approaching NJ 17. 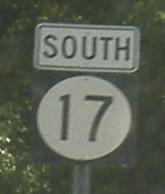 NJ 4 is close, but it's sure not multiplexed with NJ 17, nor did it change directions. On these older assemblies (as all of these are), the priority was getting both 17 and 4 together, since so many people near either of those routes are looking for both. 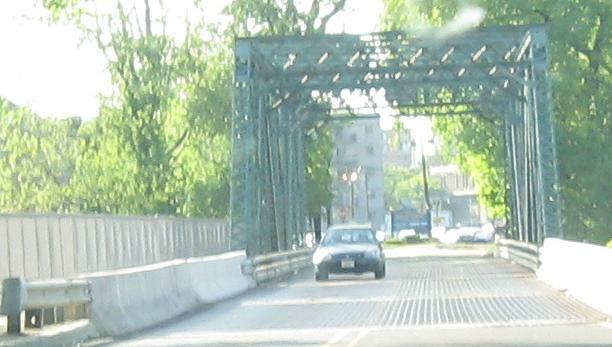 West over the Hackensack River on the Midtown Bridge, W. Main St. and CR 56. 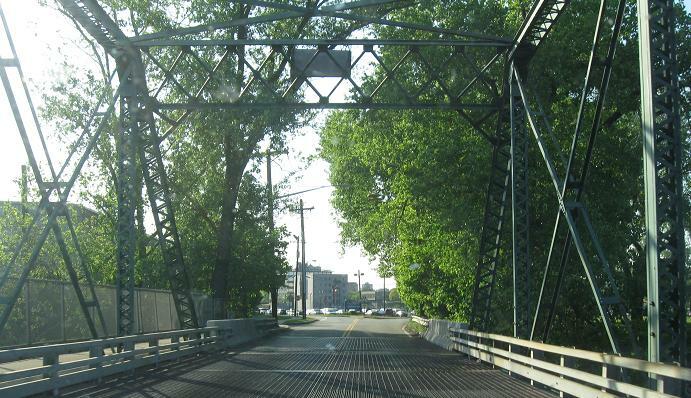 Looking east at the bridge from E. Salem St. and north along the river. Elm Ave. NB in Bogota. Take a careful look - Bogota (or maybe Bergen County, since we're talking CR 56) uses upside-down signal mast arms. I wonder if they perform better or worse than the right-side-up ones. Thank CC Slater for spotting these. Fort Lee Road WB, over the I-95 Exit 70 partial cloverleaf (SB uses one ramp, and WB-NB is missing) that creates a six-roadway setup on I-95 (inner express, outer local, and a pair of Exit 70 C-D roads). CR 12 reappears - still no sign of CR 56. 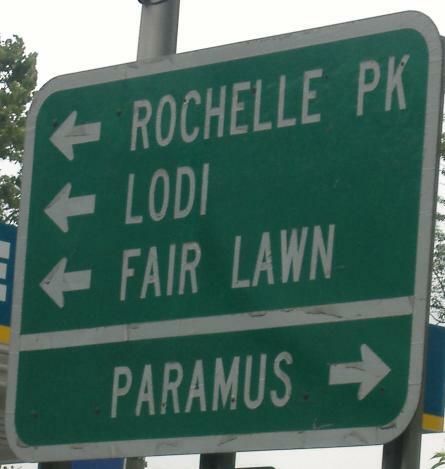 The other way on Fort Lee Rd., where one of the state-name shields is not like the others. 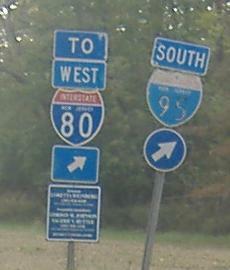 Notice the use of the Turnpike-standard circular arrow in the second photo, but in a blue color. 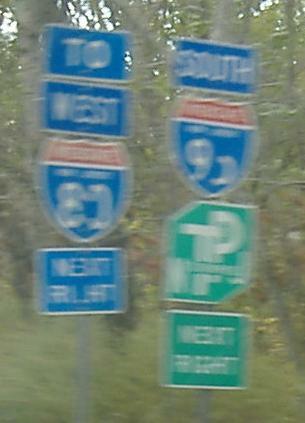 This part of I-95 is in Turnpike Authority jurisdiction, but not part of the Turnpike itself. 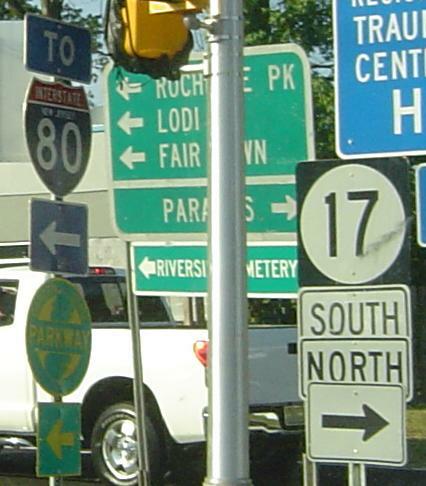 Normally the Turnpike Authority only provides guide signage to the Turnpike, even though most of it is I-95 as well, but there's no alternative in this case. As you see in the first photo, it tried. 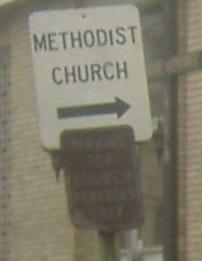 Parking for church purposes only, embossed purposes at that, EB in Fort Lee.